The Blackjack Bonanza slots do not try to do anything as silly as compete with blackjack. Click here to play! In fact, they do not try to compete with the flamboyance of video slots, either. What the Blackjack Bonanza slots do instead is offer a simple experience that should appeal to blackjack players who are not in the right state of mind to play blackjack well. While a blackjack gambler is unlikely to play slots on a regular basis, they may do so on the odd occasion when they do not feel up to playing their usual game. In such times, it makes sense that a blackjack player would look for a slot game similar in visual design and play style to blackjack. The Blackjack Bonanza slots offer just such a game. 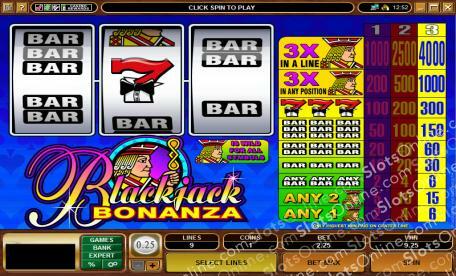 As a 3-reel slot with a single payline, the Blackjack Bonanza slots play very quickly. Most people who play blackjack like the speed of the game, and this slot machine most definitely has speed. There is also a certain level of class associated with blackjack, and these slots acknowledge that by using a Jack symbol for the jackpot combination, as well as special lucky tuxedo 7 symbols. It's surprising, but the bet amounts allowed in Blackjack Bonanza can compete with those of blackjack, with a possible maximum bet of 1500 credits per spin. This makes the game perfect for high roller players of all stripes. Honestly, if you like fast, high stakes slots action with a table game flavor, then be sure to check out the Blackjack Bonanza slots. Jack symbols act as substitutes for any other symbol.